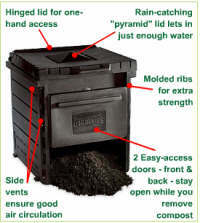 You've probably seen the ready-made composters available for small to medium sized gardens. 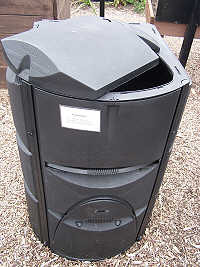 Their good design owes much to moulded recycled plastics. They work by a steady thru-put of regular small-scale additions of organic matter. The time and expense to build a small heap with timber construction hardly seems worth it. That's why the (re-cycled) plastic container is an exciting development. They solve the problem of low input, save space and still produce the goods. With smaller gardens that's ideal. Without a doubt this is perhaps the simplest and one of the best small containers for recycling. Two sizes available. 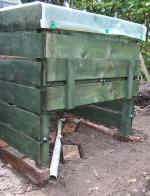 The one-piece compost bin is easily lifted off the heap whole to move to a new location. You can easily turn the heap by repositioning the container beside the heap and spading the material back into it again. Note: an additional Converter Base Plate is available for mounting on solid surfaces or to prevent vermin entry. The removable bottom door provides easy access to finished product - and it's all free. A removable upper shelf retains material for an initial stage of rapid hot decomposition. Slide the shelf back to let the material down the middle section where decomposition continues. Finally use a rod to push the material down to the bottom to mature. By this system the organic matter that is at the same stage of decomposition gets hotter than would being mixed with older material. 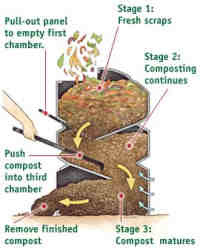 The system more or less prevents unfinished organic matter from mixing with completed garden compost. You'll find the Earthmaker on this link in the U.K.
Another 'down to earth' garden bin. This one simply snaps together. If you have arthritic fingers then you'll find the push button opening lid an improvement on the converter. Also the doors can be used as leaf collecting scoops. 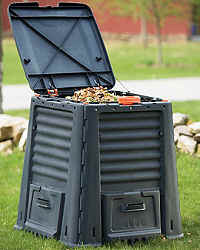 Find more details and compare several garden composters on this link . in the U.K. accessories include a simple aerator.